Focus Booster. 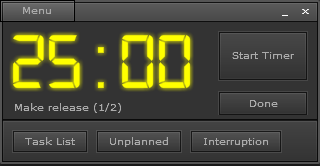 A free, slickly designed timer app that’s available on the web, as well as on the desktop via an AIR application, so it works on both Windows (s msft) and Mac (s aapl). Pomodairo. Another free AIR-based desktop app. As well as acting as a simple timer for your pomodoros, it can track tasks, and time unplanned work and interruption. Tomatoi.st. A simple web-based pomodoro timer. Pomodori. A pomodoro timer that can also record session information and help you plan future activities with detailed reports. TimeBoxed. An unobtrusive and customizable timer app for the Mac. The time bar changes color to warn you of your approaching deadline. You can choose from a variety of alerts: sound, speech alert, visual animations and Growl messages. Menubar Countdown. If you really want to keep things simple, this is a basic countdown timer that displays itself on the right-hand side of the Mac OS X menu bar. Keep Focused. A portable Windows app that not only acts as a session timer, it can also be used to record what you did in each session for a daily review, too. MaToMaTo. An animated Pomodoro Technique timer. It’s pretty simple and has no additional task management features. 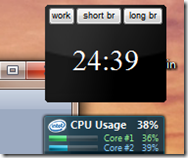 Pomodoro Windows 7 gadget. If you have Windows 7, you can install this simple desktop gadget to time your pomodoros. Finally, if you have an iPhone (s aapl), you could also use Navel Labs’ Pomodoro Timer, a neat app that looks and works just like the real-life kitchen timer; it’s not in my list above, though, as it’s not free. Have I missed any useful timer apps? Let me know in the comments! I prefer to use Quick Timer (Windows gadget). Custom period durations for two back-to-back timers, plus a selection of sounds. As a gadget, it’s off to the side and very unobtrusive. You forgot Pomodoro (http://pomodoro.ugolandini.com/). I’ve been using this one forever and it’s one of the best I’ve ever used. I’ll have to give it a try, Zachary. Yes second this. I haven’t tried the others so can’t offer a comparison but I’ve been using Pomodoro for a long time and consider it essential.